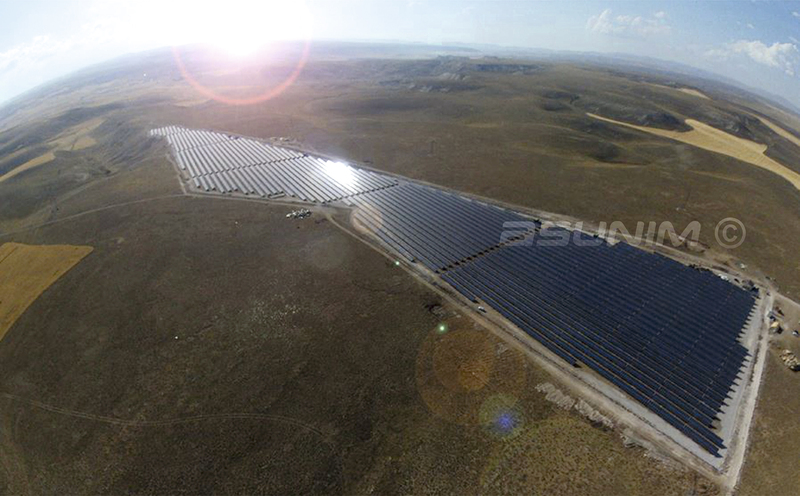 With the 10.9MWp System presented here, Asunim Turkey has now completed the second licensed Solar Power Plant. Another two licenses are currently still under construction and scheduled for connection in September which will then total 37MW total nominal licensed system capacity installed by Asunim. This means that Asunim currently ranks first among its competitors at construction of licenced solar power plants (SPPs). Umut Gurbuz, General Manager of Asunim Turkey stated that, as we started the mobilization process in January, the weather and conditions were tough but the system was finalized successfully on budget and on time. Because of the rocky soil, drill and excavation works were excessive. As in all our other projects, we use the leading manufacturer’s products, and implement the systems with constant supervision by our excellent engineering and construction department. We also owe a debt of gratitude to the investors who put their trust in us. The operation and maintenance of YBT Energys system will be covered by Maxima Energy, the separate O&M company of Asunim Turkey. Founder of YBT Energy, Yusuf Bahadır Turhan indicated; we worked hard in order to develop this project and all the process like pre-feasibility analysis, pre-license apply, EPC tender and contract and loan contract. Overall this process lasted eight years and we all feel extremely delighted to see the project is done. With this SPP, we now own a 30 MW Renewable Energy portfolio that generates carbon-neutral electricty for Turkey. Watch a footage of the construction process here. YBT Enerji, based in Ankara, Turkey, is an energy investment company, which develops and realises renewable energy-based power plants. Company currently operates 3 run-of-the-river HEPPs and 2 unlicensed SPPs in different cities of Turkey. All projects were developed from green-field to operation by the company itself, like the new 10.9 MWp Hamal solar power plant in Kangal, Sivas. YBT dedicates itself to clean and sustainable environment and continues to develop new projects in hydro, solar, wind and biomass. The company also is an actor in the energy market with its shares of Energy Markets Operating Company (EPİAŞ in Turkish). Asunim is based in Ankara, Turkey and operates as a consultant, project developer and EPC and O&M company with focus on project legalization, engineering, component supply and the execution of photovoltaic power plants in the Turkish market and greater region. It belongs to the Asunim group with current further subsidiaries in Portugal, Spain, Dubai and the United Kingdom, accumulating a current track record above 850MW.